# Wash and drain the lentil, chop the onion, potato and carrot. Boil all these preferably in a pressure cooker by adding 5 cup of water until lentil became pap. # Put the oil and flour in a separate cooking pot, roast until flourâ€™s smell goes away. # Pour the pepper and tomato pastes, which are smashed by a cup of hot water, on it. # Add the mint and black pepper when the paste gets cooked. 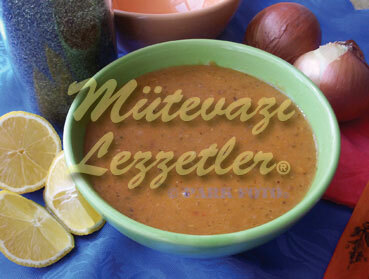 # In the meantime blend the vegetables and lentil until it gets smooth. # Add this mixture to the mixture little by little with stirring. Add 1 cup of gravy and 3 cup of water. # When it starts to boil turn the heat to low and simmer for 5 more minutes. Serve hot. Note: It is able to cook this meal without using carrot. If you donâ€™t use carrot you should use 1 cup less boiling water.